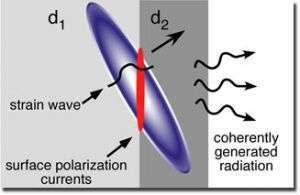 Electromagnetic radiation is produced when an acoustic wave (purple) generates electric currents (red) as it propagates past an interface between two piezoelectric materials. The radiation propagates outside of the materials and can be detected to determine the shape of the acoustic wave with nearly atomic scale resolution. Acoustic waves play many everyday roles - from communication between people to ultrasound imaging. Now the highest frequency acoustic waves in materials, with nearly atomic-scale wavelengths, promise to be useful probes of nanostructures such as LED lights. However, detecting them isn't so easy. Top: Comparison of strain rate in a molecular dynamics simulation at a AlN/GaN interface to the calculated electric field measured 1 mm from the inter- face for a shock wave with properties given in the text. The time-dependence of the electric field is closely related to the strain rate at the interface enabling direct resolution of THz frequency strain waves. Bottom: Frequency as a function of time for the electromagnetic radiation. An 8 THz harmonic of a 4 THz fundamental corresponds to atomic scale spatial structure around 5 angstroms. 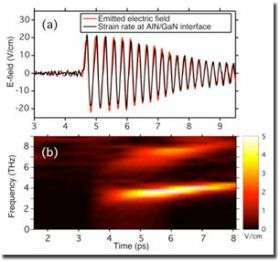 Reed and colleagues studied the effect for an interface between two thin films, which are used in LED (light-emitting diode) nanostructures, and are piezoelectric (electric currents that are generated when they are squeezed). Piezoelectric materials have been used for decades as arrival time gauges for shock-wave experiments but have been limited by electrical equipment that can only detect acoustic frequencies less than 10 gigathertz (GHz), precluding observation of the highest frequency acoustic waves. The new THz radiation technique can help improve the time resolution of such approaches.